"The primary purpose of an allotment is to provide crops of vegetables, fruit, flowers and culinary herbs for household use and the more completely a plot fulfils this objective the greater should be the credit accorded to it in competition. The size of plot should not be a factor for consideration in competition." (Royal Horticultural Show Handbook). 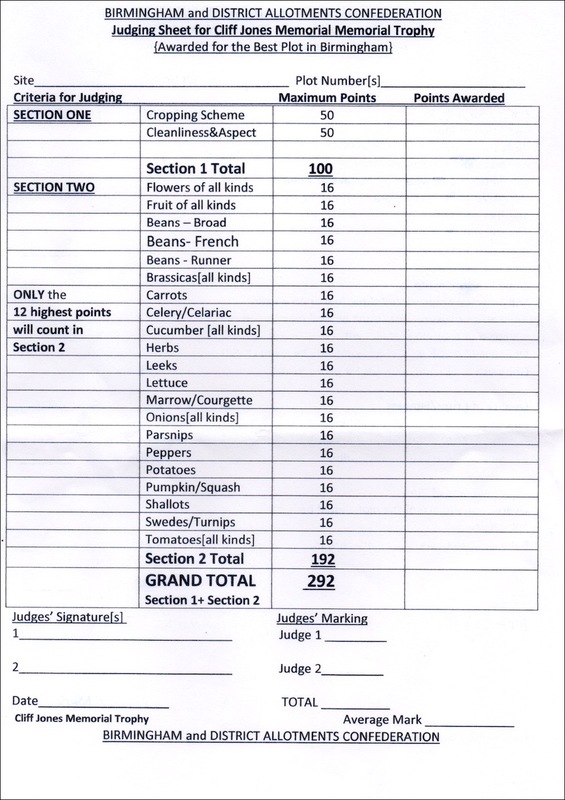 The judges use a marking sheet to assist them. This year the organisers have revamped the scoring system. The new judging/scoring sheet is shown below. A broad range of food crops both vegetable and fruit should be in cultivation and flowers grown for cutting or decoration should be assessed on the same basis as the food crops.Grouping of crops according to their cultivation needs e.g. roots, brassicas, legumes. onions, leeks, salads, fruit, herbs, flowers. Clear evidence of crop rotation. Plots should be well stocked with crops clearly labelled. Soil between the crops should contain little or no evidence of weeds, paths and leisure areas should be neat and edged. Intelligent use of organic methods of pest control such as pinching out of broad bean tips to inhibit blackfly or the use of barriers against carrot fly should be given credit. Unplanted areas where crops have just been harvested or that are about to be planted up should be clean and free of weeds and the soil should be of a good, well cultivated condition and texture.The overall appearance of the plot should he neat and pleasing and the balance of the of plot cultivation should he as broad as possible. Layout and economical use of space is also considered. Sheds, if present, should be of neat and workmanlike appearance both inside and out. Frames, cloches, greenhouses and compost bins should he clean and well maintained, overcoming local problems. For further information about how plots are judged please contact the Site Secretary.